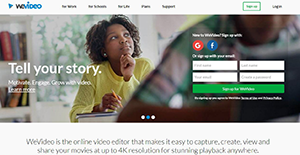 WeVideo is an easy-to-use and cloud-based video editing and sharing suite for schools, business, and third-party media. The application is crafted to enable users to capture, create, view, and even share movies at high resolutions. It’s a powerful, fully-featured program that utilizes JumpStart technology to transform the landscape for video editing. The multi-platform video editor provides a seamless editing experience thanks to its support for multiple formats of video, audio, images, and graphics. It also offers a set of features that allow for the effortless creation of stunning movies in minutes. Some of its key features include; 720p video resolution, WeVideo JumpStart, Cloud storage, Motion titles, Screencasting, Green screen, Music library, Slow motion, and Voiceover. In addition, all WeVideo plans include multi-track editing and storyboard, advanced text editing, built-in graphics, customizable environment, and file & media manager. Another noteworthy feature for WeVideo is its cloud-based nature. This brings a collaboration advantage and allows you to invite friends to make different edits on the same footage. Its cloud storage coupled with its cross-platform functionality enables you to work anytime and anywhere. It provides the flexibility to mix previously uploaded media with the locally stored media simultaneously. In addition, you do not have to worry about compatibility – the application works well on any device including Mac, Windows, iOS, Android, and Chromebook. WeVideo also provides multiple video editing modes that make it easy to convert ideas into superb movies. For instance, the storyboard allows you to effortlessly create stunning movies in minutes. On the other hand, the timeline mode provides more advanced features for the pros. It gives you the opportunity to mix and match over 600 formats of video, audio, and images using the special effects, green screen, speed control, graphics, and more. If you are interested in WeVideo it may also be a good idea to analyze other subcategories of Best Video Editing Software collected in our database of SaaS software reviews. Each organization has different requirements and requires an application that can be personalized for their size, kind of employees and clients, and the specific industry they are in. For these reasons, no platform can offer perfect functionality out-of-the-box. When you look for a software system, first be sure what you require it for. Read some WeVideo reviews and ask yourself do you want basic features or do you want advanced tools? Are there any industry-specific features that you are looking for? Find the answers to these questions to assist your search. There are lots of aspects that you need to consider and these include your budget, specific business requirements, your company size, integration requirements etc. Take your time, check out a few free trials, and finally select the platform that offers all that you want to improve your company effectiveness and productivity. How Much Does WeVideo Cost? We realize that when you make a decision to buy Video Editing Software it’s important not only to see how experts evaluate it in their reviews, but also to find out if the real people and companies that buy it are actually satisfied with the product. That’s why we’ve created our behavior-based Customer Satisfaction Algorithm™ that gathers customer reviews, comments and WeVideo reviews across a wide range of social media sites. The data is then presented in an easy to digest form showing how many people had positive and negative experience with WeVideo. With that information at hand you should be equipped to make an informed buying decision that you won’t regret. What are WeVideo pricing details? What integrations are available for WeVideo? WeVideo comes with open RESTful APIs information, which means you can build custom integrations with any third-party system or application. It is easy to use and provides many options even in the free version. If you need more information about WeVideo or you simply have a question let us know what you need and we’ll forward your request directly to the vendor.